A rockfall caused this explosion of lava and smoke at the Kilauea crater in Hawaii Volcanoes National Park in this photo taken from a USGS video. Rockfall from the side of the Kilauea crater triggered an explosion of lava and smoke at the volcano in Hawaii Volcanoes National Park. The Kilauea volcano on the Big Island of Hawaii has put on a pyrotechnic display over the past week, including a rockfall that caused a dramatic fiery explosion of lava and smoke Sunday. The volcano, one of the most active in the world, lies within Hawaii Volcanoes National Park and is easily visited. A park road rings the crater (although part of it has been closed in recent years because of ongoing volcanic fumes and ashfall) and a hotel sits on the rim. Over the past week the fiery lava lake that underlies the crater floor has been more visible than usual, glowing molten-red. In an even more dramatic turn, part of the Halemaʻumaʻu Crater wall collapsed Sunday. That sent rock tumbling into the lava lake at the bottom of the crater, said the U.S. Geological Survey’s Hawaiian Volcano Observatory, triggering an “explosion of spatter and a robust particle-laden plume.” In addition, fist-size rocks were flung unto the (fortunately closed) Halemaʻumaʻu visitor overlook. 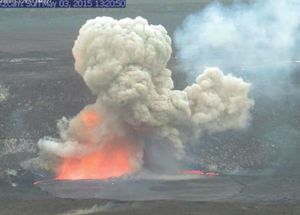 Get Kilauea updates and photos at the Hawaiian Volcano Observatory website and see a USGS video of the explosion (keep watching beyond the text intro), including the sloshing of the fiery lava lake after the impact.